Supplementary material reads: "Chernus. Harbor. Captions. Navy dispensary. Salk shots. Two negs show l. to r.: Lieutenant Leona Jones administering Salk shot to Mrs. Winifred Wells, who holds her 6-month-old son Monte, who was also given shot. 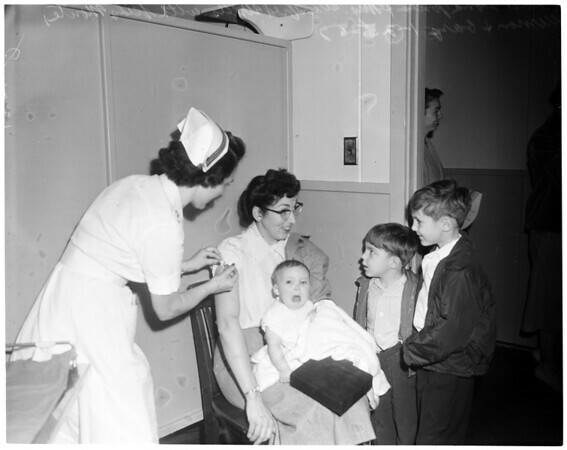 Vernon Wells, 3, and Garry Wells, 7, look on to see how mother took needle before they are given shot. The family lives at 5521 Coke Avenue, Lakewood".